This week I'm bringing you a hearty, thrifty remix of one of the most popular recipes of all time: hamburger pie! 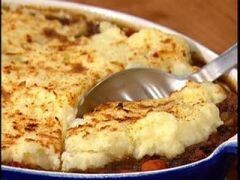 Also known as shepherd's pie, this traditional Irish dish consists of a meat base (originally lamb), a layer of vegetable (usually green beans), and mashed potato as the topper. It's a delicious, easy-on-the-budget dinner that can feed an army! You know, growing up, everything and everybody was Italian. For years I thought there was a singer named Nat Kingcola, and that the kitchen appliance that keeps our food cold was called an ice-a-box! Obviously, food was no different -- if there was any way to make a dish more Italian, my family found it. Today, I'm going to share with you the DeAngelis family twist on shepherd's pie. This dish can be made in a multi-service roasting pan, or in individual serving dishes. The recipe provided is for an individual serving, but can easily be multiplied to feed the masses. For the base of this dish, take 1/3 lb. of loose Italian sausage meat, 1 cup of fresh chopped broccoli rabe or other leafy green, 1/4 cup of diced provolone cheese, and 2 tablespoons of tomato paste (or as I call it, Italian Duct Tape - it'll bring anything together). Pan sear this until cooked, adding some fennel seed if the sausage you have on hand doesn't have any. For the next layer, combine 2 cups of Italian flat beans, 1/4 cup of onions, 1/4 cup sliced mushrooms, salt and pepper to taste, and into the fry pan they go with some good olive oil. Cook for about ten minutes, then add about 4 chopped cloves of garlic just before your turn the heat off. Now spoon this over the layer of sausage. The topping is the standard mashed potatoes, however I love to mix in some roasted garlic and Parmesan cheese to give it that Italian flair. Spoon the mashed potato mix over the other fillings, sprinkle some paprika on top, and pop the whole thing into a preheated 375 degree oven for 45 minutes, or until the potato topping is golden brown. And there you have it: an easy Italian twist on a tasty classic that will keep both you and your wallet full and happy! Chef Louie hosts Good Day Food & Wine, a nationally syndicated weekend radio show. A culinary veteran, Chef Louie pledges to empower you in the kitchen, the supermarket, and help you eat better, entertain better and keep more of that hard-earned money close to home. Sign up for his free e-newsletter here.